In 1928 Robert Knight and Lucius H. Zeuch presented their original research on the Chicago Portage in a paper commissioned by the Chicago Historical Society titled: "THE LOCATION OF THE CHICAGO PORTAGE ROUTE OF THE SEVENTEENTH CENTURY". 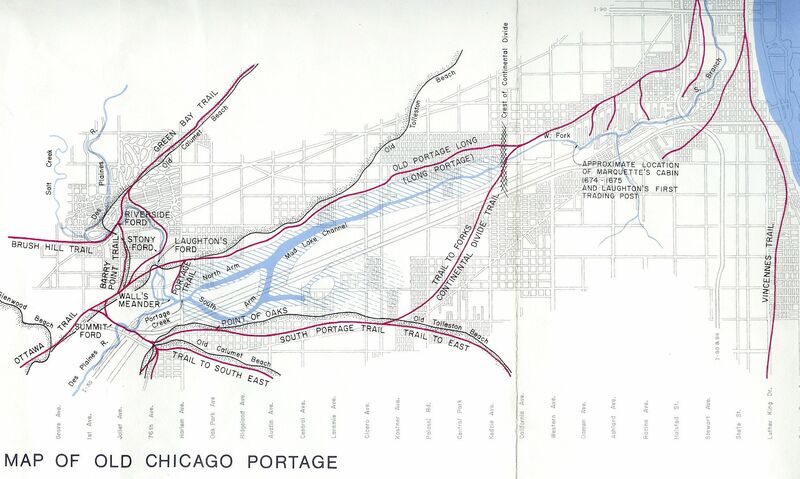 Knight created a map of the Portage and located the points where the Portage Trail crossed existing streets. In 1975 Wm. Rose and Associates produced a "Design Study" for the Chicago Portage National Historic Site for the Forest Preserve District of Cook County that included a map that built on Knight's work. Click on the map to the right to see it in full detail. The map shows the portage area. It show the past in the forefront superimposed on the present grid of Chicago's streets. It shows the ancient beach lines of previous versions of Lake Michigan in black. It show the ancient footpaths in red and their relation to the old beaches. It vividly portrays the reasons the west end of the Chicago portage was, and still is, a place of connections.